Thanks yours, 2nd.inst. with enclosure of your business envelope bearing the caricatures of Laurel & Hardy - wish you lots of success in your new venture. Am enclosing the address of a friend of mine - a collector of L&H films - suggest you send him a listing of the titles you have for sale. I have many letters from Fans asking where they can obtain these films, so I shall of course advise them of your address. Stan gave me Mike Polacek’s address on a small piece of paper with this letter. Richard Burton is a very fine actor, am sure his performance of "Hamlet" was excellent but I am not too sure about doing Shakespeare in the modern costume instead of the traditional "Period" — am not by any means an authority on Shakespeare, its just a personal opinion, maybe if I saw it done in the modern I'd feel as you do. I can imagine the show draws a lot of curiosity seekers on account of the Scandal situation. Re being given a Knighthood, this is not confined to the entertainment World, it an honorary degree for anybody outside the acting profession — for outstanding service — humanity etc. In show Bus. not only those in the Dramatic field have been titled — many comics too, Sir Harry Lauder — Sir George Robey etc.etc. these two were knighted for their entertaining in the Front Line Trenches during the Wars — Charity Benefit performances etc. Thanks for the compliment, I am not in that category. No I have'nt heard from Patricia Ellis — have never seen or heard of her since she appeared in that film with us ("Blockheads") a very attractive Gal at that time. Re the Westerns, I did'nt produce them — just had a financial interest in that Co. Cheap 'Quickies'. I am a Grandfather — have two Grandchildren Boy & Girl 14 & 13 years old. About all Glenn, so Bye for now. 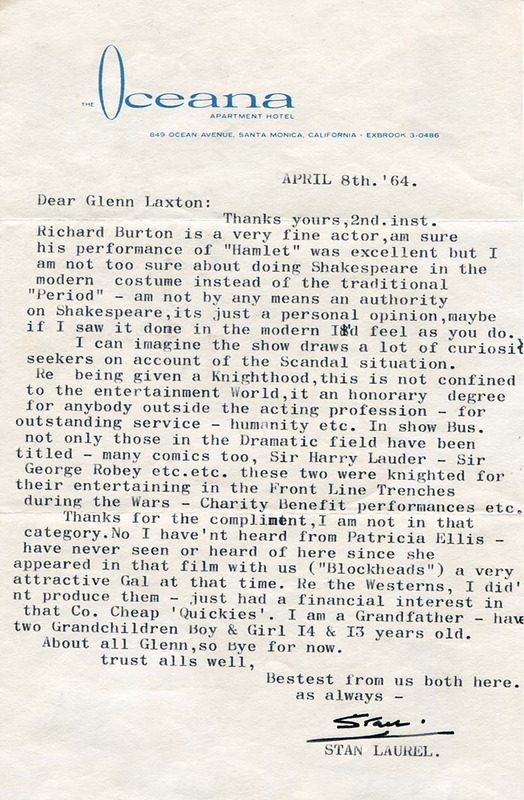 Because Richard Burton disliked wearing period costumes, director John Gielgud conceived of a production of Hamlet performed in a “rehearsal” setting with an incomplete set and the actors wearing what appeared to be street clothes. This production ran from April 9 through August 8, 1964 at the Lunt-Fontanne Theatre in New York City. The Beatles’ accent—they were all born in the same County as I was, Lancashire. My accent, of course, is not so pronounced due to my leaving that area in my very early days and being raised partly in Northumberland and Scotland. My Lancashire accent does appear occasionally in my speech—unconsciously. Re the 'Beatles' accent, they were all born in the same County as I was - Lancashire, my accent of course is not so pronounced due my leaving that area in my very early days & raised partly in Northumberland & Scotland (Newcastle & Glasgow.) & then of course touring the Country in general in the Music Halls - my Lancashire accent does appear occasionally in my speech (unconsciously). I saw one of those 'Backward' video tapes on the Steve Allen show, its very effective - interesting to note Chuck McCann introduced it, it has a lot of possibilities if given a lot of thought to the shooting script, very unique. Chuck has a great Flair for this type of thing, he's very inventive. Note you saw Chase & Reed again during your recent trip to the 'Catskills' - I felt from the start their reference to L&H was a lot of Baloney. Not much new to tell you Richard, so Mrs L. joins in kindest & bestest to you & yours. The Beatles made their American television debut on The Ed Sullivan Show on February 9, 1964. I was very saddened to receive your letter of March 17th.ult. bearing the news of your Grandpa's death. Please convey my sincere deep sympathy to your Aunt Sheila & to all the family. Am sure you will all miss him very much, God Bless him. I was very fond of Jackie for many many years (about 55 years since we first met) a great talent. Well this is a sad situation we all have to face - so we have to reconcile to Gods Will. My love & kind thoughts to you all. Sorry Bob [Stowell] my delay acknowledging your recent letter - have'nt been feeling too good. Re your suggestion to visit me some Sunday - would prefer Saturday, around 2-30.PM will be convenient for you please advise or if I do'nt hear from you further I shall expect you. Hope you enjoy the Club meeting. 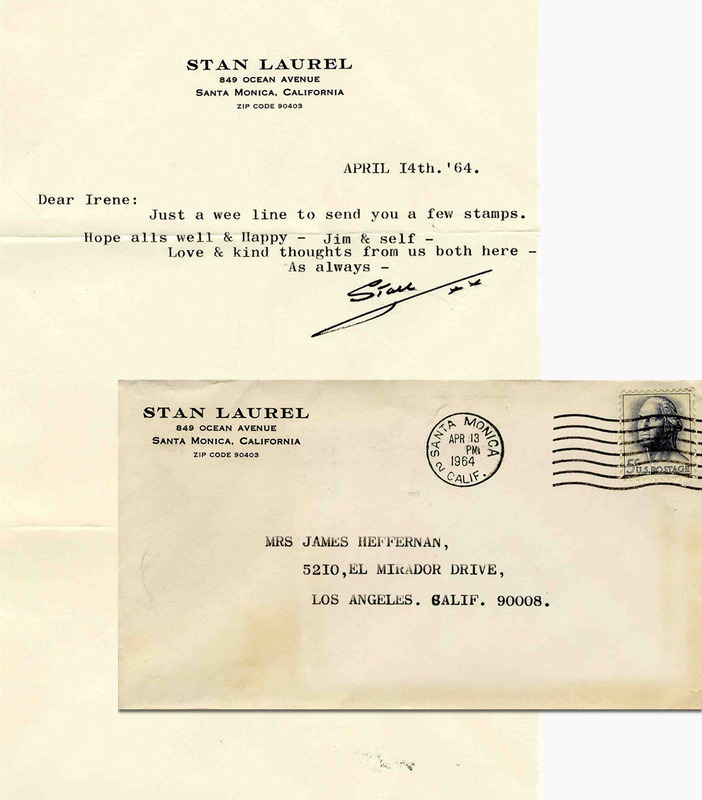 Stan told me about the first Laurel and Hardy fan club—the Laurel and Hardy Club of America. Naturally, I joined it. Just a wee line to send you a few stamps. Thanks Tom [Sefton] your cards en route your Eastern trip - being on business I appreciate the time out & kindly thought - just recd. a card from Father Conway whom you met recently back East - told me you talked about L&H. Hope your new film prints were satisfactory & you're happy with them. Mrs L. joins in kind thoughts to Donna, Self & Family & remember us kindly to Ben [Chadwell] when you see him. Variety was the basic training for any category in the ‘arts.’ There are no responsible managements today, not a real showman among them. A dirty rotten shame. Well, we are fortunate to be out of this deterioration. Pleased to know you recd. the Alex Braun tape & enjoyed it. Note Senor Macdonnel is grieving over not having any "TOPS", you're so right, he has no one to blame but himself for encouraging the 'STRIP SHOW' merchants to dominate the 'HALLS' along with those microphone song recording elements - The managements - Agents et al subscribed to the fall of show business - unfortunately it will never recover in the spirit that we knew it - VARIETY was the backbone of show business, developed every type of talent for the entire theatrical profession - Great Dramatic Actors like HARRY CHAMPION, J.C. SCATTER (too numerable to mention.!!) kidding aside, variety was the basic training for any category in the 'ARTS' - there are no responsible managements today, not a real showman among them - a dirty rotten shame - well, we are fortunate to be out of this deterioration. Jewel & Warris were foolish to refuse an audition - this was required for the Royal Command Performance at the Palladium no matter who you were or how well known the particular act was - this was actually a dress rehearsal - there certainly no reflection on their material or performance, it was necessary for the timing of the entire show plus the proper arrangements of the acts in their appearance. No doubt they will lose a lot of work in those American Clubs overseas & as you say, they are now not as important as they were in the past. TOO BAD. Georgie Wood has'nt had a column in the "STAGE" for a long time now, anyway thanks for sending me a copy, frankly, I did'nt know it was still in circulation, thought it had folded like the other trade papers, 'Encore' etc. - those used to be our "BIBLES". The weather here was really hot for about a month during Feb & March, many days in the 90's & over, now its cold - rainy & windy, but still its very pleasant, does'nt affect me anyway as I seldom go outdoors only to	VISIT my Dr. for a check up. Hope you got the George Gobel Tape by now - you'll soon have enough material now to arrange a new act - maybe you could pick up some extra dough making occasional club appearances - figure out an act that would be easy for you, no props or comedy costumes - no makeup - walk on in your street suit - American Style.!! carry your music in your pocket (only new 2 or 3 parts) hand them to the conductor - explain you couldn't get here for rehearsal, so you'd like to run through your act now before making your regular appearance on the program - the exit & make a brand new entrance into your act like a rehearsal - just a wild thought Vic, but maybe get you thinking about it - who knows it may be worthwhile.?!! you got loads of material am sure.! Stan’s reference to “Great Dramatic Actors like Harry Champion” and “J.C. Scatter” is a joking reference to their very non-dramatic stage acts. Harry Champion, was a famous British music star known for his wide repertoire of cockney songs—many of them sung at breakneck speed—including “I’m Henery the Eighth, I Am” (a big hit remake for Herman’s Hermits in 1965); while J.C. Scatter’s stage act included dressing as a female fruit seller, singing “The Orange Lass,” as he juggled oranges. I was always under the impression that "Sugar Daddies" was the same story as "Chickens Come Home" (Sound version) but I was wrong - we did however use the prominent gag out of 'Daddies' in Chickens - riding on Finlaysons back for a disguise routine. The scene with me in "Seeing the World" I remember making now I was making "Sugar Daddies" at the same time. No I had nothing to do with the making of "BROMO & JULIET" Leo McCarey directed that one. I did direct "Chasing the Chaser" I made five one reelers with Finlayson - very cheap - Roach was trying to sell Finlayson to Pathe for a release series - but nothing materialized so they were discarded. Had a letter from a young chap James Loughlin, 87,Woodside Green, PORTADOWN.CO. ARMAGH. NORTH IRELAND. has a 16.mm projector, wants to collect L&H films - especially looking for a print of "Bonnie Scotland" - thought maybe you'd like to get in touch with him - will send you his letter as soon as I answer it. Thanks for the new stories - the one about the business man's wife and daughter in Florida is a 'DILLY' - very funny. That "Seeing the World" is a very bad film, plus the print - I felt sorry for Finlayson practically working alone with nothing funny to do - He made every face in the book in this one.!! Rand Brooks has been delayed one week. Now is due to arrive London May 5th. If anything further develops will advise you. Love from us both here. The reverse of this picture postcard features a photo of Stan at his desk, signed “Remember Me? !” It was sent to Stan’s sister Beatrice and her husband Bill Healey. Rand Brooks, the actor who played Scarlett O’Hara’s ill-fated first husband in Gone with the Wind and who gave Marilyn Monroe her first screen kiss, was married to Stan’s daughter Lois. Indeed nice to hear from you & to know the old L&H films have afforded you so much pleasure - appreciate very much your kind sentiments so warmly expressed. Pleased to know you are enjoying your assignment in France, but am sure you are looking forward to returning home in August - note you will visit England en route - my Sister lives in Grantham,Lincs. Yes, we are very fortunate to have L.B.J. in replacement of our late beloved J.F.K. – that was a shocking, sickening tragedy, a great loss to the whole World – God bless him. P.S. No, am not a pipe smoker & I quit Cigarettes about three years ago – suddenly lost all desire for tobacco, never ever thought this would happen to me being a chain smoker for many many years. !